Most religions encompass a code for living one’s life, a moral code if you like, or an ethical code. This usually reflects the inate qualities of the folk whose religion it is, the capabilities that exist within them. Hence a savage folk will have a savage code, a folk capable of higher things, a higher code. 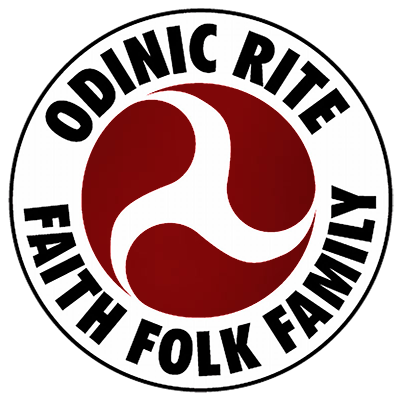 The Odinic code is natural, life-affirming, and noble, and very often in direct contrast to the Judeo/Christian code. This is seen in many examples, but for the sake of space let us look at just one – PRIDE. To the Christians pride is a sin. This was relentlessly pushed by the leaders and missionaries of the Judeo/Christian ‘Empire’. Whether they themselves believed it is open to debate, but they taught the folk pride is a sin. This view, of course, goes hand in glove with the creed which states that everyone is guilty of sin from the moment they are born. Even the act of procreation is viewed as a sin. Material existence is sinful. This anti-life creed would naturally see pride as a sin. But the Odinic outlook sees pride as a virtue. Pride always has been and still is one of the major factors in motivating action. It has been a central force behind the achievements of our culture. It is natural to have pride in a job well done – in achieving goals. It is entirely natural to feel a sense of pride in the advancement of one’s children, family, and folk. It is higher than the desire for mere material gain. The attempt to destroy pride has been disastrous. As a child in the early ’60s I lived on a council estate. I remember that the women included cleaning the street outside their homes as part of house-cleaning. This reflected a ‘pride’ in living in a clean community. This practice was discouraged by the council – it was deemed not to be a task for individuals. So it died out. Look at most of our streets today. That is just one example. Work practices have changed. At one point, people naturally took pride in their work, and this led to high craftsmanship and satisfaction. But how can one take much pride in jobs where the only motive is to churn out products by machine, where very often the worker is exploited. Greed replaces pride. Pride in living an honourable life is natural and beneficial. It is natural to wish to earn the respect of those in your community and natural to feel pride in this. But we should also be sure we don’t substitute arrogance, which is negative, for pride which is positive. Arrogance is the way of the bully who seeks not respect but fear. The arrogant will flaunt their strength or wealth. They will bully and intimidate those, even within their own community, who they perceive as weaker. The true warriors will protect those who are weaker within their community. Let us then, try to live in a way which makes our families and ourselves proud – not arrogant. It is the corruption and destruction of natural virtues which has created a great deal of harm to our folk. May we lead the restoration!